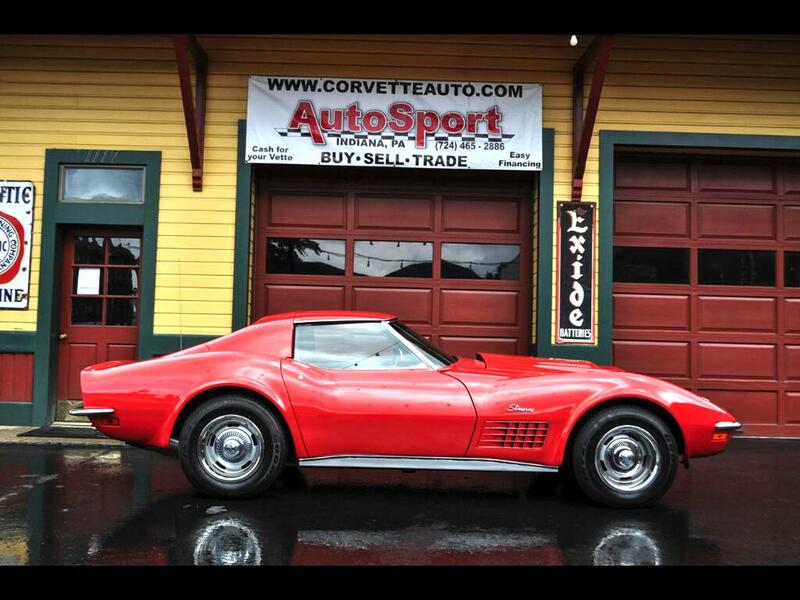 Used 1971 Chevrolet Corvette Documented Frame Off Restored #'s Matching Org Doc for Sale in Indiana PA 15701 AutoSport Co.
For sale is a complete nut and bolt frame off restored Mille Miglia Red 454 Big Block 1971 Corvette Coupe! There has been no expense spared in this detailed frame off restoration and we have receipts totaling over $40,000.00!! This is a real deal documented #’s Matching big block Corvette loaded with some good options. This car was frame off restored and done like an LS6 425hp Corvette. The amount of detail they went through on this restoration is impressive. The engine was built to spec of an LS6 engine, and there is a dyno sheet of this car putting close 450hp w/500 ft lbs of torque to the ground! The suspension is beefed up just like and LS6 would be. There are detailed receipts you can pour over on this car and you can see what was done. The factory options on the car are; Factory AC, Power Steering, Power Brakes, Milli Miglia Red, Black Interior, 454ci Engine, Automatic Transmission, Ralley Wheels, Black Wall Tires, and an AM-FM Radio, added options are the LS6 upgrades w/ the frame off restoration. The Milli Miglia Red Paint is show quality and is in excellent condition. The body is in excellent condition as well with a good fit and finish all the way around. The big block LS6 hood fits perfectly and is the and is the only thing that gives this car away, she is the true definition of a “Sleeper”. All the chrome and stainless has been redone or replaced new. The interior is new, and is in excellent show quality condition. Looking over the instrument panel the gauges have been refurbished and look new. The center console is new, as is the rest of the interior including the seat covers, door panels, and carpet. Under the hood it is set up like an LS6 Corvette with the big Aluminum high rise intake. The AC pump is off the car but the AC system is complete. We have brand new in the box an AC pump with the components, all new from Vintage Air out of Texas ready to be installed in the car. The frame is in excellent condition as are all the suspension parts on this Corvette. The original Build Sheet was taken off the gas tank and there are some pictures of it. The gentleman who had this car restored sent the original tank sheet out to be restored as well and their receipts for $2400.00 that show this. In the documents there are receipts for work that has been done and a disc with pictures of the restoration process. There is a bunch of information to go over on this amazing Corvette please feel free to call us at 814-977-9219 or email us with any questions. PLEASE CHECK OUT THE VIDEO ON THIS AMAZING CORVETTE!